Wow. I have to say that this movie is enough to leave one speechless at times, and for a variety of reasons. The fifth installment of the Kara no Kyoukai series, Mujun Rasen (Paradox Spiral), is somewhat of a departure from the previous four outings not just in terms of its running time (almost two hours), but also in terms of art direction and story. Set around two months after Fukan Fuukei, the tale begins with a disjointed sequence of events that are gradually cleared up as the movie continues. 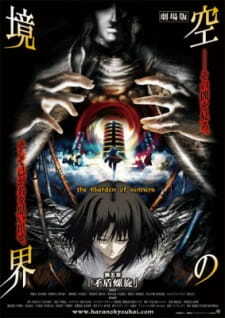 The story itself centres around a boy named Enjou Tomoe, who is saved from a group of thugs by Ryougi Shiki. She invites him to stay with her after he begs her to hide him somewhere as he believes that he has committed a crime and appears to be on the run. During this time it seems that Kokuto Mikiya is away on some business, and Aozaki Touko is investigating an odd rumour she has heard from a policeman she knows. Now the main problem with the story direction is that many people will be confused by the path it takes. There are numerous sequences that are repeated several times, and the story has a tendency to not only jump about from one time to another, but also from one event to another (a style similar to that used by Luc Besson at times). The result is something more along the lines of a Satoshi Kon production, and while there will be many people who enjoy the numerous twists, turns, loops and whorls that take place in the story, there will be just as many who will be put off by the overwhelming amount of information one has to process at times. The art and animation throughout the series thus far has been top notch, however there is a noticeable drop in quality in this Mujun Rasen. Given the length of the movie it may be that Ufotable were forced to cut some corners with the designs and animation, but there are quite a few scenes where their normal quality really shines through. The CG is, as always, of a very high standard and runs smoothly in conjunction with the normal animation. The backgrounds and backdrops are well designed, and a lot of thought has gone into ensuring that certain elements in this area follow the concept of the story. Unfortunately, the drop in quality I mentioned is noticeable in several scenes, and in one in particular, the character looks constipated rather than hysterical. In addition to this the animation of the action sequences, whilst being excellent overall, suffers towards the end of the movie, with one key sequence being more dizzying than breathtaking. That said, the sequence in question will appeal to those who like roller coasters at the very least. The sound is on par with the other movies and is well executed overall. The effects are extremely good throughout, but the old problem of the noise sometimes being too overwhelming has reared its head once more. The score used throughout the Mujun Rasen lends to the general atmosphere, however there are times when the music seems a little out of sync with the on-screen action. On the plus side it seems my prayers have been answered as more is revealed about Touko, especially as the antagonist in this film, Araya Souren (who appeared briefly at the very end of the previous movie declaring himself to be a magus), has a history with her. In addition to this, there is a secondary character named Cornelius Alba who also has a history with both Touko and Araya. In addition to this the viewer can finally see some different sides to Shiki, as well as gaining some insight into why Touko was so interested in her during the events of Garan no Dou. The downside is that Mikiya continues to be more of a supporting role in this movie, and Tomoe, while generally being a decent character for the most part, may annoy some people. Even with those flaws, this is still an excellent movie (especially if you can get your head around the plot). Fans of Kara no Kyoukai should generally be pleased with this latest addition to the franchise, and although it does drop a little in terms of animation and artwork, Mujun Rasen will hopefully herald a new direction for the series. *Some of the review got deleted... wtf? I'll try rewriting a little, but I can't guarantee success. OK, so this is version 3 of my KnK 5 review after watching the movie for the second time and getting part of my first review deleted. The full summary part has been taken off to keep the size down (I spent a lot of time on that too). I will be more in-depth and critical this time around. Before you read this review or watch the movie, make sure you've watched the first 4 KnK movies. Scores are based on 2nd time around. Comments and private messages are appreciated to help me review better next time around. The thing to note for #5 compared to the other 4 is that this time, the movie is nearly 2 hours long. That's more than double any of the previous movies. However, the story is by no means slow, and there are more than enough turn-arounds and absurd twists to keep it enjoyable. Odd installments of flashbacks and repeating scenes make the whole thing a bit difficult to follow, but overall, the story was unique compared to the other Kara no Kyoukai episodes and understandable if you've watched the other 4. By this time, you should be quite familiar with Shiki's as well as Touko's abilities. The problem with the first time around was the confusing non-linear story pattern. The montage when Shiki reappears was helpful at clearing this up, and the second time through, I could grasp some of the deeper meaning in some of the obscure statements. Araya and Touko had some really profound quotes that only truly struck me after watching the movie again (this time, I didn't have to worry about catching the plot). Philosophically, it was almost like GiTS for me. I also noticed some real logic lapses the second time around. Stuff like how the police didn't do a follow-up and the lack of blood in some scenes and excess of blood in other scenes. Some of the coming back from the dead and not being fazed by stab wounds are also ridiculous, but within the bounds of a supernatural anime like KnK. I was going to give this a 9, but I suppose art also entails animation. As always, KnK has some of the best (or possibly the best) animation of all time. The fights are packed full of excitement and every attack is conveyed beautifully. Again, Shiki's eyes are as beautiful as ever, and there is plenty of blood. This time around, there is more than one fight scene, so it's almost like double the awesomeness. KnK is basically the height of animation quality. There were a few lapses here and there and some sloppy artwork in some places, but the second time made me concentrate more on how beautiful the animation really is. Sometimes, I take KnK for granted, but compared to other anime, this is on its own level. Since there were 3 fight scenes, I am satisfied that there weren't any blatant drops in quality for any of them. Some criticisms for you picky people include lack of blood during the stabbing scene and some cgi moments that were less than superb. Also, Touko regrows her teeth in her fight and Mikiya is present in the very beginning of Touko's fight on the ground (1:07:32 in the gg-Takajun subs) when he shouldn't be (he disappears in the next set of frames). Overall excellent though. Every person has their own personal taste with music. For me, the soundtrack of every KnK movie is beautiful, and this is no exception. With mixes of familiar tracks from the previous 4 movies as well as a few of its own, KnK 5 has perhaps the best soundtrack of the entire series so far. Additionally, the ED song is Sprinter, which is my favorite Kalafina song so far. The thing that makes KnK so amazing is not only the animation quality and straight-up beauty of the fight scenes, but also the incredible bgm that backs each fight scene up. Ever since the first movie, the bgm that they play has never failed to engage me more into the story and "feel" the emotions. I downloaded a rip of the KnK 5 OST after watching it the first time. Lo and behold, the second time around, I loved it even more. Once again, Sprinter is a definite plus. Sure, the soundtrack is a bit repetitive, especially from other KnK movies, but I think that's what makes it great. Why take down a winning formula? That being said, this is the best OST of the 5 movies in my opinion because it combines many great tracks into a full 2 hours, along with adding a few compositions of its own. If animation is the one thing KnK is associated with, character would be a close second. From the utterly confusing first movie to the scene-setting second movie, we've seen Shiki, Mikiya, and Touko develop. Now that I have become comfortable with Shiki, I consider her to be one of the most interesting characters of any anime, regardless of her eyes. Her monotone conversations never cease to amuse me, and she gets in a lot of time talking with Tomoe, the new character. The psychological aspects of KnK 5 rival those of some of the previous movies, and there is some questioning on the side of the "bad guys" as to what "absolute wisdom" is. If you've seen and understood the other movies, the character development in this is just as good, if not better because we get to see a side of Touko that has not been revealed before. So I HAD reviews of individual characters, but it got eaten up by the MAL system somehow... Basically, there was some fluctuation between characters. Shiki and Touko really shone through this one, but Enjou was just annoying in some ways and Mikiya got almost no screen time. To reiterate, Shiki was just adorable at times, which is part of the reasoning behind the high score. I don't really remember what I had written here before, but basically, this is well worth the time to watch. Heck, I even watched it twice... Just absolutely fantastic fight scenes and some serious plot development to think over. Watch it again if you want. The fight scenes are still top-notch and engaging. Plot elements may drag on for the second time, but it's helpful to know what's going on as it's going on. Extremely impressive movie with some serious psychological elements interweaved into a complex plot. As always with KnK, incredible animation and character development. Basically what I'm trying to say is that this was one of the best things I have ever seen, anime or not, and something that I rewatched a week after seeing it the first time (don't forget that it's 2 hours long). The Garden Of Sinners Movie 5. After having watched the four prequels of the series and finishing the fifth just now, I will write this review based on the information we have up to now for the characters, storyline and so on. Not for what this series could be or how the adaptation should have been either. Also, this is my first actual review, so I hope I will end up being helpful to those reading this. Ok, let's begin! I'll seperate this into 5 parts. The 5th part of the series does not fail to deliver yet another storyline that will not confuse the viewer, as long as he pays attention to the dialogue, that most of the time drives the show along. Mystery, incredible twists and gore scenes lead to this increadibly dark show. The reason behind my 9 is based on the fact that I found the mystery absolutely original, it's something I have never seen nor did I ever think of, and the way it was explained in the movie was simple and clear. As for its negative side, the only part of it that always annoyed me was the order of the series themselves. It never had a fluent continuation, a new movie was always beginning from a new checkpoint making it unclear at times. The main characters are extremely well drawn. The simillarities between this movie and Fate/Zero are quite obvious, especially in the faces/eyes. Takeuchi Takashi is easily one of my favourite character designers and he has not failed to impress me yet another time. I can guarantee satisfaction on this certain aspect. As for the animation, compared to the rest of the movies it was downgraded due to the length. However, ufotable is like pizza. Even when it is bad, it is still good. This part of the show is still its high point and when it has to get good, you know it will. The fights are excellent, wild and bloody as always, the movements are smooth and realistic and will keep the viewer glued to the screen whenever they occur. Just like the movies before it, and, from what I've read, the movies after it, the sound is fitting always to the situation, energetic as well as calming whenever it should be, however, in this particular movie, the soundtracks tend to get very loud, making it hard to hear the voice actors or focusing on certain situations, although that really gives you an adrenalin dose when it should. The characters in this movie had their best performance yet. We have seen each one of them in action this time, as well as proof of their intelligence and the potential that they have in the development of the story. We also get introduced to the counterpart of Shiki, who is the main focus of the first half of the show. The mystery that, as mentioned above impressed me the most in this movie was revolving around him, so I really enjoyed his stay on the show. Overall, this movie's advantages far outdo its flaws and the viewer will remain speechless at times. It deliveres pure entertainment. Intense plot, with truly well done fight sequences that might make your jaw drop. That's what made me make a review on this particular movie. Do not hold back from watching. And do it as many times as you want. I hope I helped you out and I'll try and get better with reviewing. This is a great film that I can recommend to almost any anime watcher, even those who have yet to see any of the other Kara no Kyoukai movies. Mujun Rasen (Paradox Spiral) has a lot of "popcorn" action and suspense while still being fully immersed in Kara no Kyoukai's dark world. Be sure to watch it on Blu-ray quality video. The story is much faster paced than the first four movies, which was sorely needed. One fault of the Nasuverse (the deep and underlying mythos of Fate, Tsukihime, and KnK) is that some concepts (such as the "counter-force") are hard to grasp, and this film is so focused on its quick pace that it leaves a somewhat ambiguous explanation of the concept. This isn't a huge detriment to the plot, and the climax of the movie does not rely upon those concepts to a fault. In fact, it is a welcome change from the "infodump" style of exposition favored in the first four films. Watch it till the end, enjoy the story, maybe we can talk about it later. Don't want to spoil people here. While not as extravagantly and thoroughly detailed as say, a studio Ghibili movie, ufotable does an amazing job of translating the film's brutal action and menacing atmosphere into a visual experience. Small visual queues such as a half empty Haagen Dazs strawberry ice cream cup (how much did these guys pay ufotable anyways???) permeate and reappear in disjointed scenes to accentuate the unsettling and discontinuous atmosphere of the whole movie. The music is excellent, and the huge number of small audio queues that repeat throughout the most jarring scenes of the movies only add to the shock value. The story of Enjou Tomoe is the backbone of the character development in this movie. Through his unreliable and disturbed mind we see the nature of evil afoot in this film. The main antagonist embodies inhumanity at its most noble form. The characters are strong, yes, but its hard to gather all of their motives accurately from this single film. Again, the way that ufotable handled which characters to flesh out the most is much better than any "infodump", so it is not a detriment to the series; if nothing a reason to watch the rest of it. The most important scenes of the film are filled with amazing cinematography and symbolism towards the story's main themes. The final half of the movie will stun you in terms of animation and plot development. Now excuse me as I watch this masterpiece again.